This is my favorite picture from my week long visit to Hyderabad. 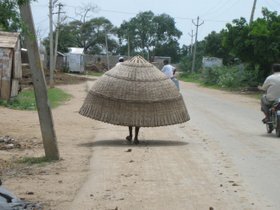 We were driving through a small town called Kurnool* when I spotted the strange sight of an oversized hat walking down on the street. I stopped the car immediately and hopped out to capture this image for the blog. The driver was amused that I thought it looked like a hat. He explained that the 'hat' was actually a portable home where baby lambs are kept by goatherds to protect them from foxes and wild dogs at night. * Kurnool is an ancient rural town about 200 kms from Hyderabad, off the national highway.